Biomethane is an eco-friendly non-fossil source of energy. Biomethane is normally produced from biogas, which is derived from organic matter such as sewage, landfill, food waste, or distillery waste. This makes biomethane a renewable source of energy. Shortage of conventional fossil fuels such as oil and natural gas and environmental degradation are major concerns worldwide. Production and use of renewable energy resources are likely to help overcome these issues. Biomethane, which is derived from biogas, can be used as vehicle fuel. Purified biomethane has the same properties as natural gas and it can function as a highly efficient and eco-friendly fuel for natural gas cars. Also, it can be injected into natural gas grids. Biomethane offers various environmental benefits when used as a transport fuel. It reduces the amount of CO2 emissions significantly. Biomethane is suitable for all engine types and all modes of transport. Biomethane has around 40 more octane numbers than gasoline fuel, which can overcome the issue of engine knocking. Increasing production of automobiles is projected to boost the demand for biomethane during the forecast period. Presently, more than 98,000 natural gas vehicles are running in Germany. Around 150 filling stations in the country offer 100% biomethane and more than 300 filling stations offer a mixture of biomethane and natural gas. The initial investment for establishing a biomethane plant is high. Certain countries provide financial assistance for construction of biomethane plants. However, financial assistance is also required for development and expansion of the plant. The process of procuring and storing feedstock is time-consuming and costly. Financial assistance is also required for collection, sorting, processing, supply, and distribution of feedstock; construction and operation of biomethane plants; and sale and distribution of biomethane. The output of biomethane needs to be sufficient and consistent to cover installation and operating costs. Surge in population across the globe, growth of the industrial sector, and rise in infrastructure development activities are boosting the demand for electricity. Electricity has facilitated functions such as interactions, industrial activities, and services. Demand for energy is increasing due to development of countries and rise in standards of living. Countries across the globe are increasing their electricity generation capacity by establishing new plants or increasing the capacity of existing plants to meet the rising demand for electricity. Companies are increasing the use of renewable sources of power generation, due to stringent government regulations on greenhouse gas (GHG) emissions. High availability of feedstock and issues related to waste management are projected to present opportunities to companies to invest in the bioenergy industry. According to International Energy Outlook–2017, the total world energy consumption is expected to increase from 575 quadrillion British thermal units (BTUs) in 2015 to 736 quadrillion BTUs by 2040, which is an increase of 28%. In September 2018, EnviTec Biogas AG signed a cooperation agreement with a China-based partner company for further development of the biogas industry in China. EnviTec Biogas AG is building a biogas plant in the province of Shanxi, China. The 1,570-m3 biogas plant is being built nearly 500 kilometers southwest of Beijing. It is the company’s fifth successful construction project in China. In September 2018, Evergaz strengthened its presence in Germany by acquiring BayWa R.E.’s biomethane plant in Lower Saxony. BayWa R.E. is a leading global developer of renewable energy. This plant is Evergaz’s third biogas plant in Germany. In September 2017, EnviTec Biogas AG enhanced its services by expanding its warehouse facilities at the Calbe/Saale site in Germany. The company plans to accelerate and improve the availability of replacement parts and consumables for plant operators in Braunschweig, Berlin, and Leipzig, thereby reducing the downtime. In March 2017, Evergaz announced the acquisition of two biogas plants in Germany. The two plants are located in Pessin and Dessau and each of them has production capacity of 1400 Nm3/h of biomethane. . In April 2015, VERBIO Vereinigte BioEnergie AG successfully commissioned a major production site at Schwedt/Oder, Germany for production of biomethane. The new plant is anticipated to use a new, internally generated technology to manufacture biomethane from 100% straw. Europe dominated the global biomethane market in 2017. The market in the region is expected to expand at a rapid pace during the forecast period. Increasing government incentives, renewable energy targets, and rising investments in the biogas technology in the region are expected to drive the biomethane market in Europe during the forecast period. Europe had 17,662 biogas plants by the end of 2016, with all 28 EU members active in the field along with Iceland, Norway, Serbia, and Switzerland. In 2016 alone, 41 new biomethane plants were opened in Europe. Germany dominated the Europe biomethane market in 2017. The global biomethane market is highly fragmented. A large number of local and international players provide biomethane services. 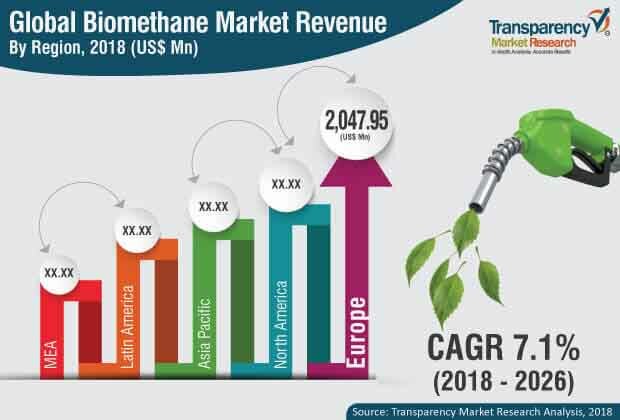 Key players operating in the global market include EnviTec Biogas AG, VERBIO Vereinigte BioEnergie AG, Future Biogas Limited, CNG Services Ltd, PlanET Biogas Global GmbH, Gazasia Ltd, Landwärme GmbH, Qila Energy, Evergaz, WELTEC BIOPOWER GmbH, ETW Energietechnik GmbH, and StormFisher Environmental.